The World Journal is a daily Chinese-language newspaper serving overseas Chinese in North America, the largest Chinese-language newspaper in the United States. Ling has been featured in the newspaper frequently. Ling has served as a Visiting Fellow at the Hoover Institution since 2016 collecting sources for a book project “Sword Blue: A Chiang Kai-shek’s Man.” It depicts a century-long history of China from 1910 to 2010 through the glories, sufferings, and adventures of Sword Blue, a top-ranking Nationalist government official in Shanxi, China. 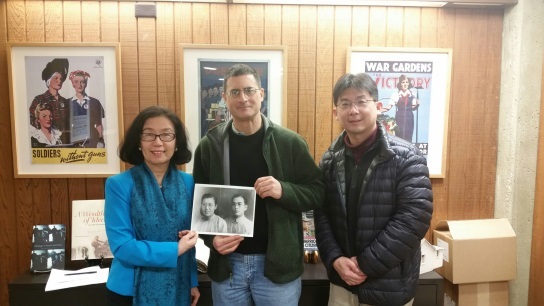 Ling recently donated her father’s archives “Papers of Linghu Pu” to Hoover. The collection spans from 1910 to 2000 and includes photos, diaries, confession papers, official certifications and government papers, Linghu and Ma family genealogies, and oral history interviews. Hoover also houses the personal diaries of Chaing Kai-shek. Ling donated her father’s archives to Hoover, with Dr. Erick Wakin, the Director of Hoover Archives and Library, and Dr. Hsiao-ting Lin, the Curator of the East Asian Collection and Research Fellow on December 16, 2016.